1. The Painted Duck :: The sister company to The Painted Pin in Buckhead, this new social joint features duckpin bowling, tasty food and drinks, and an assortment of other games to play. 2. Steady Hand Beer Co :: Slated to open in March, Steady Hand Beer Co will be opening a 14,000 square foot brewery and taproom. Located near Topgolf and Star Provisions, this is sure to be a place to be this spring. It will include a stage for live music and a patio for those warmer days! 3. Westside Park at Bellwood Quarry :: While this project is in the very beginning stages, it’s going to be a fantastic addition to West Midtown and Atlanta as a whole. As a part of the Beltline project, this public greenspace is going to be 100 acres – larger than Piedmont Park and will include views of the quarry (will be turned into a reservoir) and amazing views of the Atlanta skyline. 4. West Midtown Center :: On the corner of Northside and 17th (behind Ikea) a new shopping center is in the works. Anchored by Kroger, this new development will also include Blaze Pizza, Chipotle, Zaxby’s, and a storage facility. The project is also expected to include some multi-family and single family homes! 5. Atlantic Station Overhaul :: Atlantic Station is experiencing a major overhaul! Included in this project is an expansion of the Central Park area, new stores/restaurants, two new buildings: Atlantic Yards and T3 West Midtown, and a upgrade to the Regal Cinema. The new buildings add a combined 700,000 square foot of office space, dining, and rooftop terraces. 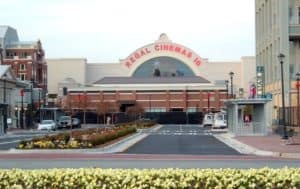 Regal Cinema will now feature a 4-D movie theater – this theater will incorporate onscreen visuals with synchronized motion chairs and environmental effects such as waster, wind, fog, scent, and more! If you’re looking to find your perfect home near all of this action in West Midtown, give us a call today!